Marvel. Hardcover. 078513669X Some wear. In a Good jacket. . Good. 2008-12-01. First Edition. New York, NY: Marvel Comics, 2008. First edition/first printing (10 9 8 7 6 5 4 3 2 1). 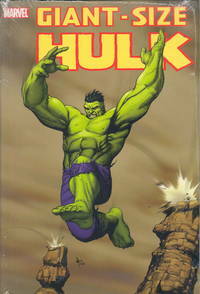 Originally published in magazine form in Giant-Size Hulk #1, Giant-Size Incredible Hulk #1, Hulk: Raging Thunder, Hulk vs. Hercules: When Titans Collide, Fantastic Four #133, and Incredible Hulk Annual #7. Book is in fine (unread) condition with a fine unclipped dustjacket protected in a Brodart wrapper. An Attractive Copy! Please feel free to ask me for pictures or more information, Thanks. . First Edition. Hard Cover. New/New. 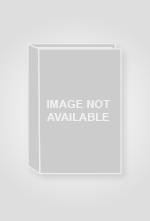 Book condition: New - Brand New Book! New York, NY, U.S.A.: Marvel Enterprises, 2008. Unknown Printing. Hard Cover. New - Brand New Book!/New. Santacruz, Juan (illustrator); Howard, Zach (illustrator); Pham, Khoi (illustrator). Brief summary of content available upon request by e-mail. NOTE - Product is brand new and in shrink wrap. New York, New York: Marvel . Hardcover. New/New. This graphic novel is unopened and still in the publisher's original shrink wrap. 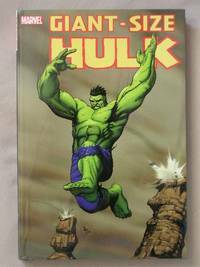 Collecting material from Giant-Size Hulk #1, Giant-Size Incredible Hulk #1, Hulk: Raging Thunder; Hulk vs. Hercules: When Titans Collide, Fantaistic Four #133 and Incredible Hulk Annual #7. Illustrated by Juan Santacruz, Mitch Breitweiser, Zach Howard, Cory Hamscher, Khoi Pham, Eric Nguyen, Reilly Brown, Bob Layton, John Byrne and Romona Fradon. The description from the back of the book is as follows: "Witness the destruction as the Green Goliath goes toe-to-toe with the Champions, Thundra and the Lion of Olympus himself, the Incredible Hercules. Then classic Hulk writer Roger Stern shows you what it's like to survive an encounter with the Hulk, all seen through the eyes of former sidekick Fred Sloan. Plus, take a journey into the past with two classic stories, reprinted here for the first time!" Marvel. Hardcover. 078513669X Please allow 4 - 14 business days for Standard shipping, within the US. Thank you for supporting our small, family-owned business! . Fair. 2008-12-01. First Edition. Marvel. Hardcover. 078513669X Please allow 4 - 14 business days for Standard shipping, within the US. Thank you for supporting our small, family-owned business! . New. 2008-12-01. First Edition. Marvel. Hardcover. 078513669X Please allow 4 - 14 business days for Standard shipping, within the US. Thank you for supporting our small, family-owned business! . Fine. 2008-12-01. First Edition.